I remember picking up Shadow of Rome in some pretty gloomy pawn shop a couple of years ago. It was a blind purchase, I knew nothing about the game, just read the blurb on the back thought it looked cool and saw Capcom made it which intrigued me. I started the game but soon after studies took priority and I just had to leave it to the side to return to later. Later become several years but I guess I got there in the end thanks to it being the latest entry in Gaming History 101’s Game Club series. So, lets see if Shadow of Rome is Capcom gold or an IP that should remain forgotten. 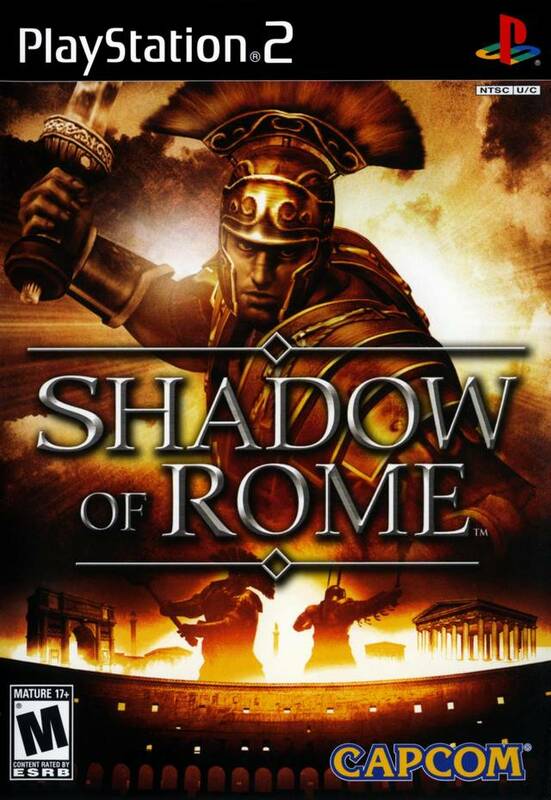 Shadow Of Rome, as the cover implies, is set in Rome. Julius Caesar has been murdered sending all of Rome into turmoil. 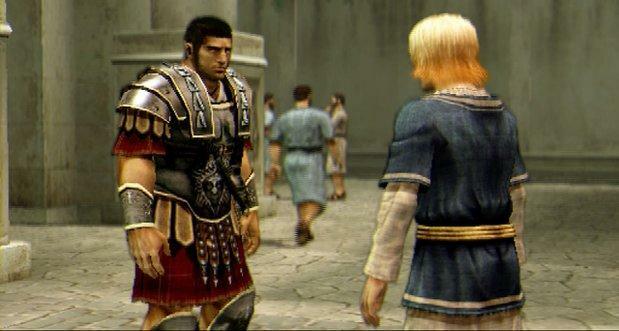 You play as two characters – Agrippa the Roman Centurion and Octavianus, who looks very similar to another long blonde haired character in a infamous Metal Gear game. It’s up to these two characters to get to the bottom of this conspiracy. The setting is actually really well thought out, I genuinely wanted to go look up Roman history after playing this game. Despite the story of the game being a work of fiction, facts about the history of Rome are presented during loading screens. Names of characters in the game like Antonius and Pompey are also based on real characters in history. The game’s story loosely mirrors the actual fate of these characters in history as well. If nothing else Shadow of Rome will make you want to learn more about the Romans and maybe even go to a museum. Graphics are very impressive. This was a late PS2 game and developers really put a lot of thought into the level environments to try re-create a believable Rome experience. The character models have a cell shaded feel to them at times, which seems to heavily clash with the game’s environments, which is quite a small flaw. The music of the game is suited to the setting though you’ll only really remember the epic tunes from the arena battles. In true Capcom fashion there is terrible voice acting in this game, but it does add to the charm if you share a nostalgic history with the company. To everyone else, it might make you cringe at times just how bad the one dialogue can be. Shadow Of Rome very much tries to mix different gameplay mechanics in one game. When you play as Agrippa the focus is on fighting and action, the gameplay is fast paced and enjoyable. Most of the time you play as Agrippa you will be in the gladiator arena. Each battle will present you with different mission objectives most of which will be to totally obliterate the opposition. You will also be presented with team battles where you have to destroy the other teams statues, rescue missions where you have to rescue a prisoner with awful AI. Mission variations are more frustrating than enjoyable as the best moments in the arena are by far when you just have to eliminate everyone else. There is one section where you will also get to have fun in the chariot races in Circus Maximus, which are a welcome change to the gameplay but only take up a small section of the overall experience. There are a variety of weapons to use in Agrippas sections from swords, spears, bows and arrows to giant maces. In the arena fights you have Salvo points which are given based on how much you please the crowd. 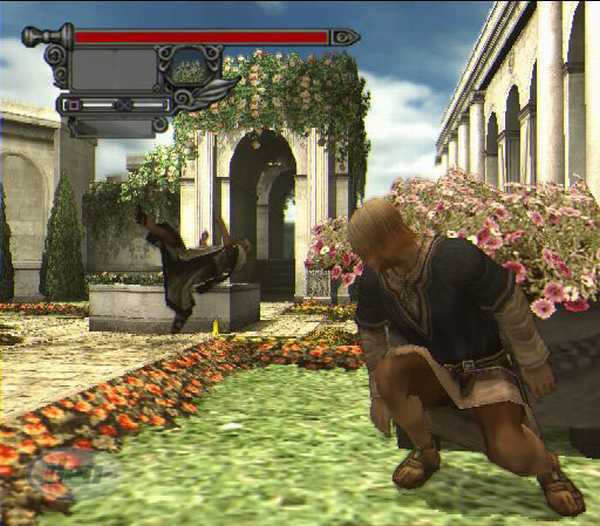 Performing certain actions like throwing a rose at a enemy will unlock a specific Salvos, which is like unlocking a achievement as it’s also named. A small bar on the bottom right of the screen will also fill up the more killing you do. Then once it’s at its peak you can cheer to the crowd and it will usually reward you with some awesome weapon to use. All weapons break after a short period so your regularly hunting around for new weapons forcing you to mix up your tactics on the fly. 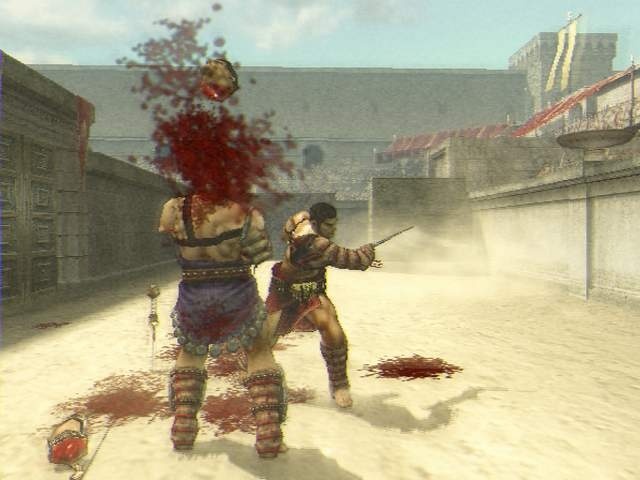 Shadow of Rome shows its true gory site in the arena fights as you are able to dismember body parts from foes, then pick up there remaining limbs and continue to humiliate them with it while they fight with one or in some cases no arms. There are also a plentiful amount of boss fights especially towards the end of the game. The key to all of these seemed to be patience. To defeat each boss you usually need to use a specific strategy as running in head first will lead to swift defeat. Then you play as Octavianus and the gameplay slows right down and becomes all about stealth. If you hate stealth games with a passion, it is quite likely where you will quit this game because you have to be very patient and take you time as one hit from a enemy will kill you. You can be spotted and run away to avoid detection but sometimes it’s just easier to restart the section. These sections generally are pretty simple and lack depth, usually there is only one way to reach the area you need to get through. This could be wearing a disguise or using items to incapacitate guards or distract them. To the credit of the game there as some unique elements added to the stealth sections. For starters wearing a disguise still makes guards suspicious, they will usually ask you what you are doing. Running away leads to instant detection and pursuit from the guard. If you wait they will ask you a question which is usually who you are or what you are doing. You are then given multiple answers to choose from. Choosing the correct answer means they will no longer be suspicious, one answer makes them suspicious but they will leave you alone and the last one makes them instantly detect and attack you. It is a nice unexpected surprise the first time it happens adding to the tension of getting caught. Another useful feature is you can view the map where enemies are located and end watch where they move in real time to plan your approach (similar to the Hitman series). Shadow of Rome is also a very long game. Your first trip and probably your only trip will take up twenty plus hours of playtime. This is not a game you will burn through and it’s likely only the most determined gamer will even see this game to completion. You’ll be halted on several occasion’s by frustrating sections to the extent you may just want to throw your controller and even your poor PS2 out of the window. The best way to approach this game is with small play sessions over a year. It has to be said though once you do reach the end it is one of the most satisfying experiences in gaming. Should you want to replay the game you can re start your playthrough on the same or increased difficulty with everything you unlocked on the previous playthrough. Overall, Shadow of Rome is a great game to play. The combat is fun and the stealth sections are tolerable and the graphics and setting of the game are unlike most games out there even today. However, once the difficulty starts to ramp up and the stealth sections start to drag and arena sections become increasingly more frustrating you may question if it is worth continuing the rest of your playthrough. But should you see this game right to the end you deserve a place in the hall of gamers with Caesars finest right next to statues of TreesLounge, Spydersvenom, and myself. For more on the game be sure to listen to the podcast right here on Gaming History 101 with very special guest Treeslounge from EZMU.